Sensory props and stimulating visual experiences encourage Rock ‘n’ Roll babies to move their bodies and make sounds with their voices – this interaction activates the brain to release chemicals that help memory. Baby – friendly percussion instruments release magical sounds and captivate and enthral our Rock ‘n’ Rollers! By reaching out and grasping for the sounds your baby will be stimulating their physical and emotional development. The more a baby is cuddled and held, the more secure and independent he will be when he gets older. 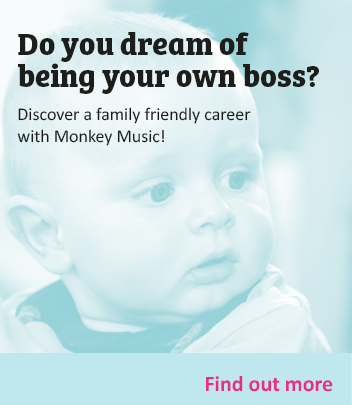 Monkey’s soothing lullabies nurture a lifetime of music and are available on CD for you to learn and sing to your baby every day. A confident child is a musical child.